"The Modern Samson," by Thomas Nast, 1868, Harper's Weekly, courtesy of the Library of Congress. 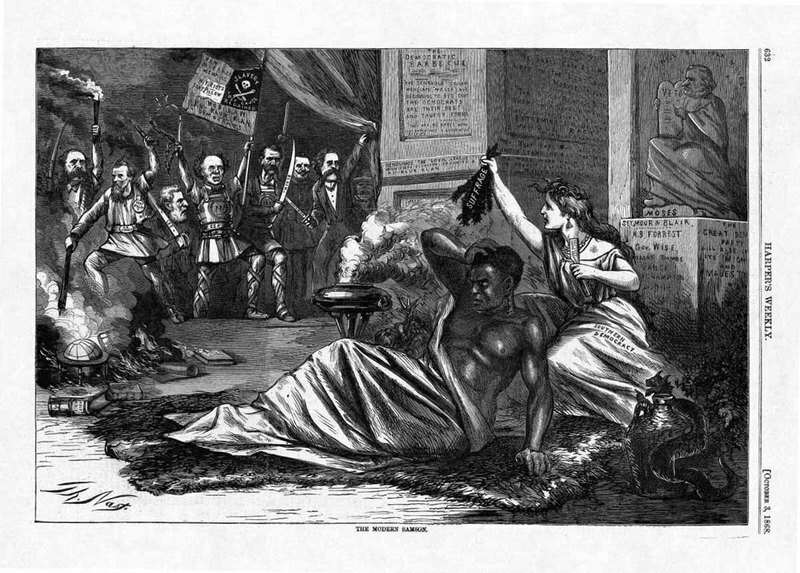 The cartoon features caricatures of armed Democratic southern politicians about to attack a former slave weakened by the loss of suffrage at the hands of "southern democracy." This struggle did not end, of course, with the overthrow of Reconstruction in the late 1870s. In the last quarter of the nineteenth century, poor white and black southerners continued their attempts to challenge racial and class inequalities. The experience of organizing during Reconstruction continued to influence black working-class activism long after the 1870s. But in the new post-Reconstruction U.S. South, with white conservatives restored to power across the region, free African Americans and their allies faced overwhelming disadvantages. The nation’s deteriorating racial climate compounded these regional difficulties. Within the Republican Party, the Radicals who had most consistently supported black rights steadily lost ground to moderates and conservatives, who were anxious to discard the Party’s commitment to racial equality in exchange for national reconciliation and new cross-regional alliances between commercial and industrial interests in the North and South. In the demands from former slaves for land redistribution, and in the curtailing of white elite power in the Reconstruction state legislatures, prominent Republicans increasingly perceived a threat to property and privilege in the North. This perception led many elite northerners to seek stability through the rigid racial hierarchy that southern white conservatives sought to preserve after the Civil War. Many of these southern conservatives were former slaveowners loyal to the Democratic Party. Significantly, after federal troops withdrew from the South and relinquished their role of protecting the rights of former slaves in the mid-1870s, they went in two directions: to the north where they were deployed in suppressing a large-scale labor upheaval by workers outraged at rising inequality and alarmed at the growing power of banks and industrial corporations; and to the west, where they implemented the final phase of the war to exterminate the Plains Indians. Reconstruction was overthrown throughout the U.S. South by the late 1870s, and the heady optimism that had accompanied the end of slavery was sapped by violence, indifference from the federal government, and new imperatives attending the rise of an expanding industrial America in the Gilded Age. Non-elite whites seldom realized that along with ex-slaves they had a stake in the outcome of the struggle in the South, but they too suffered the consequences of its defeat. Reconstruction was, in historian Eugene Genovese’s apt description, America’s “great missed opportunity,” with implications not only for former slaves and their descendants, but also for working people throughout the United States and beyond.